This past Friday afternoon, I had lunch with a good friend of mine, Michael at Bouley located in TriBeCa; Chef David Bouley’s flagship restaurant. For a chef that is pretty well known in NYC for having a miniature empire in TriBeCa – from the casual take-out cafe at Bouley Studio (that was the former location of Bouley restaurant) to the newest and intriguing (for me at least) collaboration with Chefs David Bouley, Isao Yamada and Hiroki Murashima at Brushstroke, a Kaiseki-focused Japanese restaurant – I had some high hopes to have a pretty good lunch here. 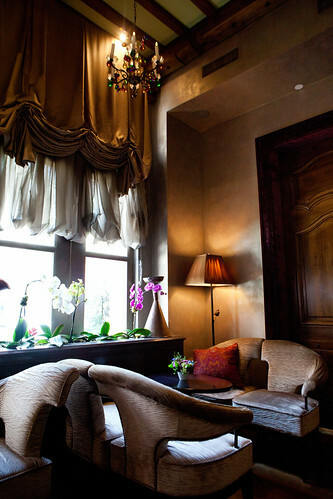 Should I blame myself setting higher expectations since Bouley also is a 1* Michelin rating? I hoped not. I made reservations on that really warm Friday afternoon. 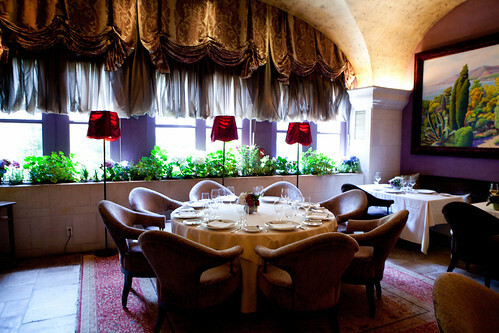 I felt bad that Michael, and all the other gentleman who dined at Bouley, had to wear jackets in order to dine here. Granted, this is a 1* fine dining establishment but other places are a bit lax on the attire requirement for the day (e.g. 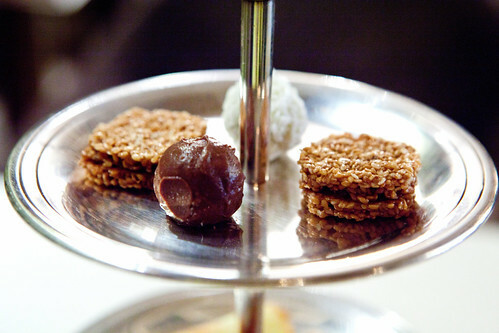 Eleven Madison Park and Jean Georges). 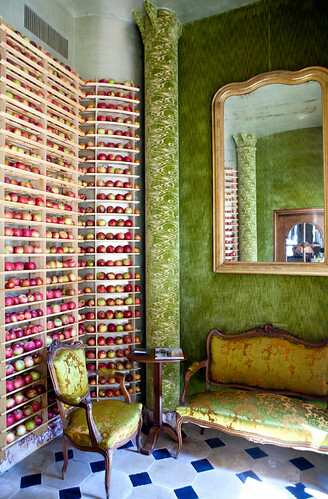 As we entered the apple-green with gold embroidery room that’s sweetly scented with fresh apples, it’s pretty enchanting to see and smell all of this. Entering to the hostess stand, we checked in and escorted to our table. 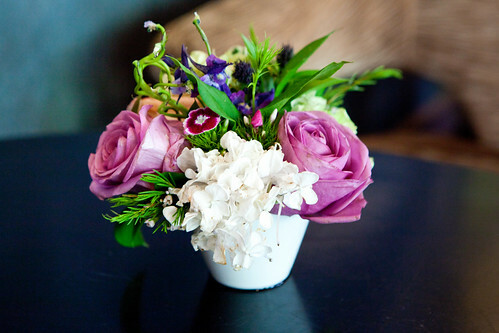 Keeping up with the appearances of flowers, from lounge to dining room, every table was graced with a small centerpiece of roses and hydrangea. 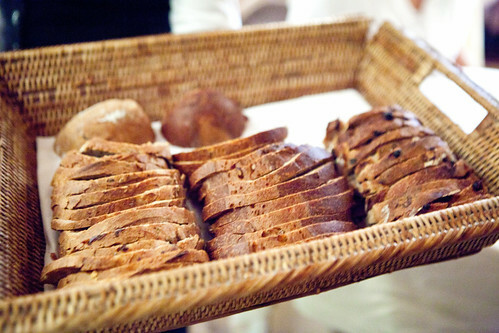 After ordering our tasting menu (5 courses for $55), bread service immediately started. 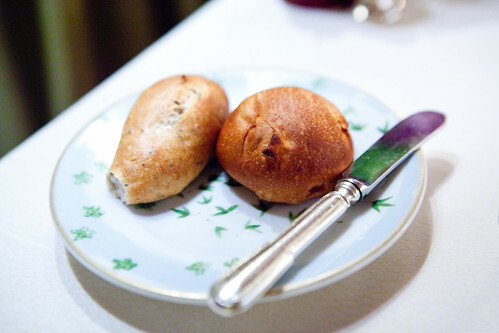 It initially started with a rosemary demi baguette and a roll filled with diced pear and a miniature pot of butter (photo). The rolls were generally disappointing, especially the crumbly crusts rather than the symphonic crackles when I pinch the bread. At least they had good flavor. Then bread was given to us again (the bread basket photo above) when we were about to start course #2, despite the fact we both had bread on our plates. 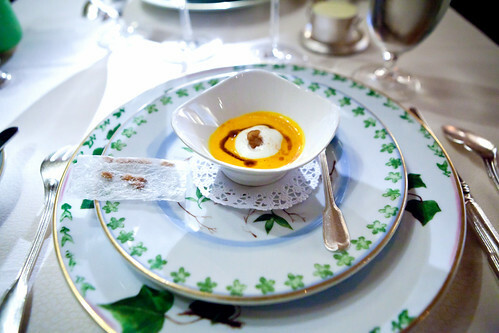 Then a young server arrived to our tables with an amuse bouche of pumpkin soup with balsamic reduction, ricotta cloud and a side of pignoli nuts that’s enveloped in an edible sugar bag. (We found out about the latter because we nibbled on it.) The soup was pretty good. Silky, velvety and not too sweet. The slightly bracing acid of balsamic cuts through the sweetness and the the ricotta added the savory element without too much weight. Moving on to our first courses. 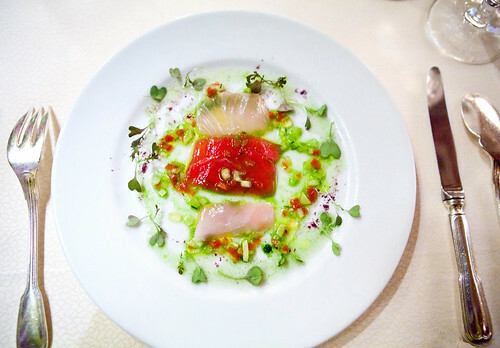 My Carpaccio of Kampachi, Young Big Eye Tuna and Striped Amber Jack was fine. 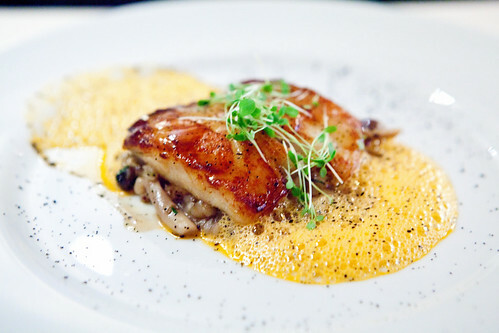 Clean, silky fish of slightly various degrees of buttery textures and flavors along with tiny bites of crunchy freshness from the diced vegetables. 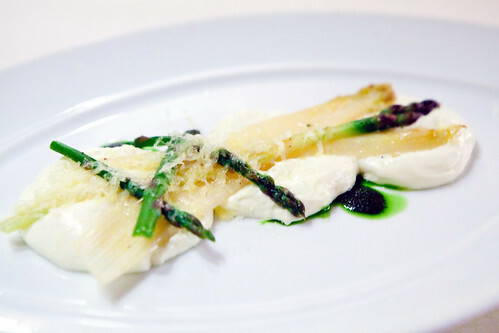 Michael’s Jumbo White French Asparagus and Roasted Green Asparagus with Pencil Asparagus Basil Dressing in a Comté Cloud fared better than mine as it has a kick of salt from from the Comté with perfectly cooked asparagus and zingy herbaceous flavors from the basil dressing. Trotting along to the second course, my Porcini flan, Alaska Dungeness Crab & Black Truffle Dashiwas my favorite dish of the entire meal. 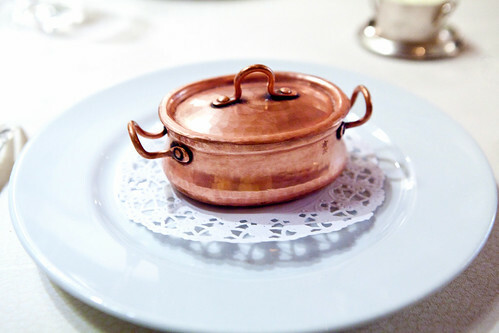 Once you lift the lid from this miniature copper pot, the fragrant funk of black truffles fill the air. 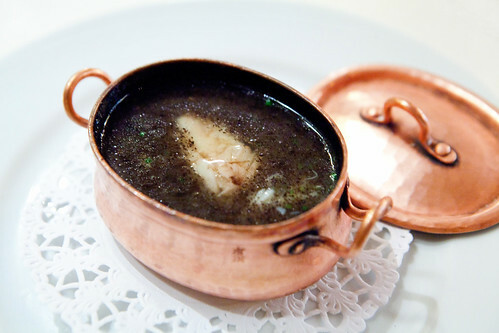 The flam is actually closer to a chawan-mushi egg custard studded with chunks of sweet crab, enoki mushrooms and flooded in aromatic black truffle dashi. Michael’s course of Black cod marinated with pistachio miso, organic Buckwheat, and ginger aromatic sauce was cooked well but the sweetness in the glaze was eerily sweet that it’s teetering thisclose to dessert territory. 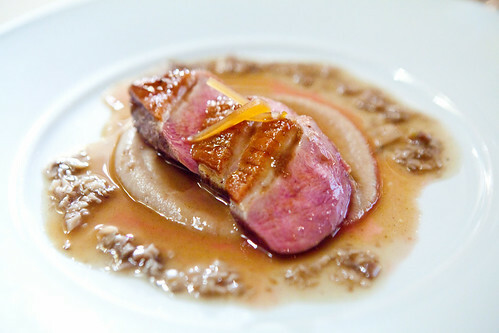 The organic Long Island Duck Roasted with white truffle honey, purée of organic dates and white turnip was interestingly good. The duck was cooked to a perfect medium rare. The skin was delicately crisp. The flavors were intriguing for having the sweetness of the truffle honey but it had a pleasant aftertaste of spice (thinking allspice, not really cinnamon). The slow braised Kobe-style beef cheeks with ricotta gnocchi, blue kale was well executed. 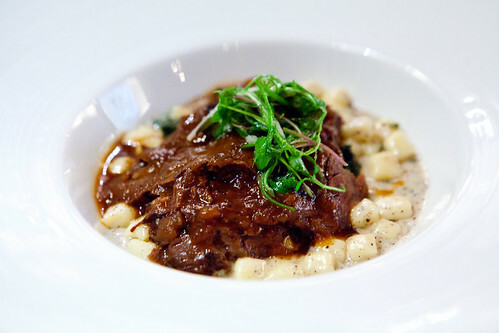 Supple, fork tender, beef cheeks that’s seasoned well with very fine gnocchi. We were also served Fingerling potato purée (photo), a gift from the chef. This purée was excellently made that I could taste potatoes rather than butter and cream with a wee bit of tuber. 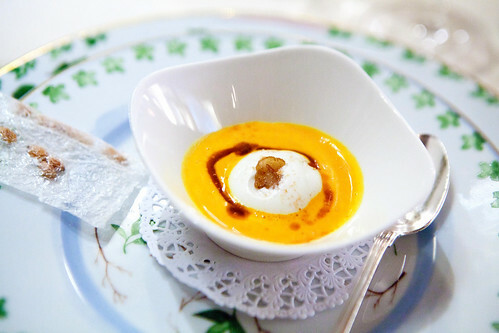 Fourth course was a speed bump to dessert territory – literally and figuratively. 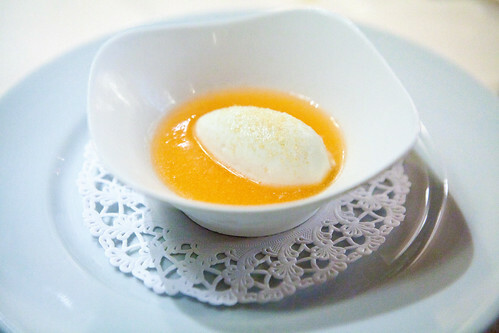 The California organic orange flesh melon soup & fresh ricotta sorbet is a familiar flavor combination. What didn’t work too well was the ricotta sorbet as it was a bit too salty for this soup. Both desserts are textbook favorites: Hot Caramelized Anjou Pear, Valrhona Chocolate, Biscuit Breton, Hot Toffee Sauce, Lemon Verbena and Tahitian Vanilla Ice Creams and Hot Valrhona Chocolate Soufflé 2011, White Coffee Cloud, Chocolate Sorbet. The pear dessert was done very well. 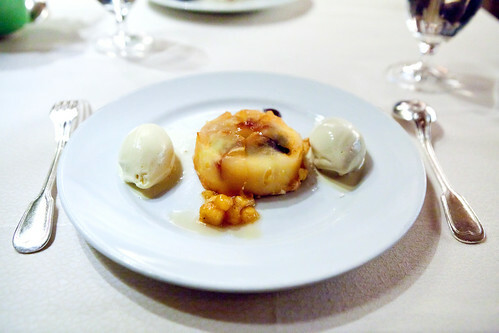 I was enamored with their ice creams more so than the pear and biscuit Breton portion. The chocolate soufflé was too over the top. 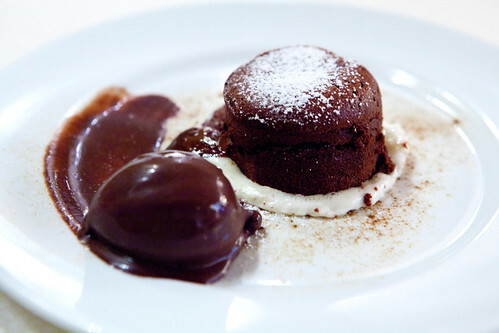 Don’t get me wrong, I love chocolate but a decadent chocolate soufflé with a rich, ice cream-like chocolate sorbet stopped me from eating by the third bite. 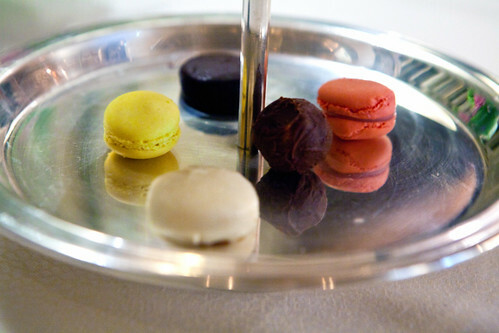 The kitchen gave us a break and presented us with petit fours. 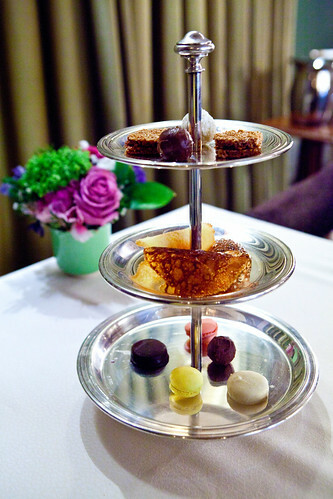 A three-tier stand of miniature sweets of macarons, chocolates, sesame brittle, and tuile cookies. Some fared better than others but the humidity didn’t help these confections by ruining some of its textures. Overall, this meal isn’t as inspiring as Eleven Madison Park for a restaurant of this caliber but the price tag isn’t too hard to swallow compared to its peers. Dress Code: Casual celebratory, jackets are required.